Bonassera screw light bulb - 6¾" (171 mm) long. 1979. 'Save it!'. 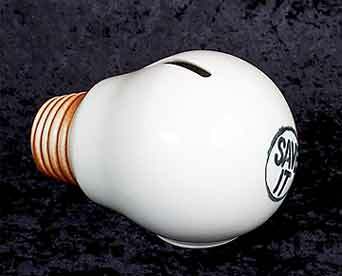 An electricity company campaign to persuade people not to use too much energy during the oil crisis. Leo Bonassera made imaginative, often somewhat off-beat pottery. An Italian, he worked in the United Kingdom from the early 1960s. He started his own studio in Kensington Church Street, London, in 1961. In the late 1970s he moved to Rye, Sussex, and rented space from David Sharp at The Mint. In the early 1980s his father died and he returned to Italy, but is now back in the United Kingdom. The name 'Rye Pottery' can be applied to ceramics produced in the small Sussex town of Rye and the surrounding area. Pottery has been produced in Rye since mediaeval times, but what is now known as Rye pottery was started at Cadborough near the end of the eighteenth century. Cadborough established the design that is now recognized as traditional for Rye pottery - applied sprigs of hops and hop leaves on pots made from local clay with a lead glaze. In the second half of the nineteenth century the Bellevue Pottery opened In Rye, and by 1890 the Cadborough Pottery had run out of family members to keep it going, and was swallowed by the thriving Bellvue Pottery. Bellvue was run by Frederick Mitchell until his death in 1875 and by his wife, Caroline, until Frederick Thomas Mitchell, their son, took over in the last decade of the nineteenth century. After the turn of the nineteenth century the company ventured into more ambitious styles, including lustre glazes. By the 20's and 30s they were producing the Jazz and Deco designs that were popular at the time. 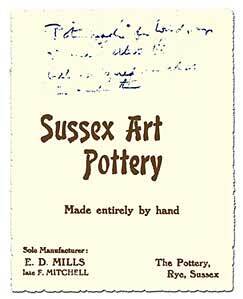 The pottery was owned by Edith Mitchell, Frederick's widow, from 1920 to 1930 and by Ella Mills from then to the outbreak of the second World War. During the tenure of these two ladies the pottery's name changed several times, being variously known as Rye Art Pottery, Sussex Art Pottery, Sussex Rustic Ware and Sussex Art Ware. After the outbreak of the Second World War the pottery had to close down due to wartime restrictions on kilns being fired during the hours of darkness. After the war the premises were bought by two young sculptors - the brothers Wally and Jack Cole, who renamed the company 'Rye Pottery'. They moved away from the traditional designs and produced high quality majolica in the styles of the fifties. They trained many apprentices, and most of them eventually left to set up their own potteries in Rye. At one time there were no less than eight individual potteries in the tiny town, making it an important centre for the trade. One of those apprentices, David Sharp (b1932-d1993), was to become a leading figure with a large following of collectors. He made very varied and original designs, some of which were quite controversial. The David Sharp Pottery continues today, run by his family and making good pieces in interesting designs. A well known activity of the pottery is the making of number or name plaques for houses, usually circular or oval, that are a distinctive feature of most of the houses in Rye and are shipped to all corners of the world. Denis Townsend is also an ex-Rye Pottery apprentice. He is know for work of very high quality, and his company, Iden Pottery, produced domestic wares for some of the most select retailers throughout the world. There is an active collectors' club devoted to Rye Pottery - The Potteries of Rye Society. If you are interested in joining, call Barry Buckton on +44 (0)1233 647898, or contact us at the Pottery Studio and we will pass your details on to Barry.